Not all interactive video solutions in the marketplace today are created equal—especially when it comes to their ability to deliver measurable return on investment. Before we get into the different types available, let’s establish why you should care about interactive video in the first place. First, as powerful as video is, and as much as we love it, it is one-size-fits-all content. It is a passive experience for the viewer, and if the video is too long, then viewers tune out. According to one study, videos up to 2 minutes get steady engagement, but attention spans start to dip after that. That’s why videos are getting shorter and shorter. A key insight to this is that people are no longer a passive audience. We have become a group of interactive users with the expectation to always be in the driver’s seat when it comes to gathering knowledge and information. Tapping, touching and swiping our way to live a better life or do a better job is now the norm. Passively consuming content, be it video or otherwise, no longer fits our needs when trying to learn or absorb complex information. One-size-fits-all video fails when the information you’re trying to relay requires more depth to be useful. So then what? Companies seek out interactive video because they are looking to drive deeper engagement by inviting the audience to take part. That participation can lead to all kinds of goodies that go way beyond engagement. Because the user is more invested in the content due to their participation, companies ultimately drive higher conversion rates from calls to action, which they can measure and optimize to extract business value. More on that later. If video is the No. 1 way to capture an audience’s attention, according to VaynerMedia CEO Gary Vaynerchuk, then interactive video is the No. 1 way to keep audiences tuned in beyond the “capture attention” stage. Interactivity allows for responsiveness and personalization by giving the user control of discovering the content that’s most useful to them. And if your end goal transcends eyeballs to needle-moving, measurable behavior change, there’s no better medium than video that is personalized and navigable like a website. To understand the differences between the different types of interactive video and why not all interactive video solutions are equal in regards to their ability to connect, engage, and deliver on measurable return on investment, it’s important to note the factors of interactive video’s growth. As more millennials enter the workplace and form households, their spending and work habits are determining how enterprises need to work and communicate. Millennials’ use of technology is the main distinguishing trait. Millennials are more numerous than any generation since the soon-to-retire baby boomers, and they expect to tap, touch, and swipe their way to getting the information they need. Sitting passively with any form of content does not match their constantly interactive, online behavior. Social, mobile, data and the cloud are accelerating the shift in power from the business to consumer. Consumers are making companies work smarter than ever before to earn their loyalty. “Put the individual at the center of their digital experience by giving them control.” This was the key takeaway from Rapt Media’s “Power of Choice” report where we surveyed 2,000 consumers about their online content consumption. For example, we found that 64 percent of consumers are more likely to spend more time with video content when able to interact with it. 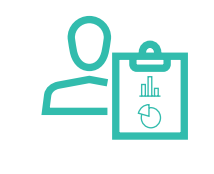 Simply put, the individual is now in the driver’s seat and needs to be digitally empowered. Your employees and customers expect digital experiences to empower and make things easy, allowing them to get to relevant information faster, make better decisions, and get things accomplished. Forrester and Accenture Interactive teamed up to explore digital transformation in their report, “Digital Transformation in the Age of the Customer,” and found that 63 percent of businesses surveyed plan to improve “online customer experience” this year. Interactivity not only turns passive content into an experience, but it also provides the mechanism for responsiveness and personalization (relevancy). Within the context of interactive experiences, relevancy is about giving the individual control to discover what is most useful to them. We know the challenge businesses face in this arena, as detailed in our report, “Future of Content: Personalizing the Content Experience,” where we surveyed 500 marketers on their thoughts around content personalization. 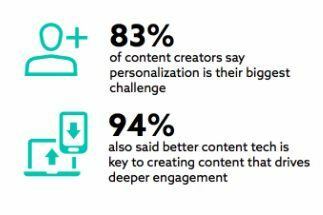 We found that personalization is the greatest challenge for 83 percent of content creators, and 94 percent said better content tech is key to creating content that drives deeper engagement. Immersive user experiences that invite participation and learning result in emotion from the individual. We call this “the gratitude effect,” and in exchange for that gratitude, we can ask something in return. That request could be a call to action built right into the interactive experience. Experiential content experiences that the consumer controls is the fastest route to deeper engagement, higher conversion rates from CTAs and return on investment. Most interactive video technologies can overlay hotspots on linear videos. Hotspots enable the viewer to click out to more information about the topic they are watching. Provides the user with more information. The user is interacting more than just hitting play and pause. This form is still a one-size-fits-all video. Linking out to additional information doesn’t provide in-depth data and insights around content preferences, nor does it let the individual choose a specific content path—both of which lead to ROI. Personalized video (Hi, Alexander!) pulls in data in advance (name, location, time, etc. ), presenting the user with a video unique to them. With content specific to them, users feel like they’re seeing a one-to-one video. Useful for walking users through complex information specific to them. Makes the content relevant to the user. The opportunity to drive behavior and derive real-time data and insights from the user behavior within the video doesn’t exist. Though personalized specifically for them, it is still a passive, linear experience and the user doesn’t have control of the content they see. User experience video, or branching interactive video, is all about user control, enabling users to drive their own experience, skip irrelevant content, and gather information at a self-determined pace. 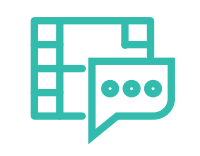 User experience video provides the equivalent value of a two-way conversation. The company delivers its information to the user who makes choices within the video, customizing the experience. The user’s actions then allow the company to derive data and insights. By providing users with control, you ultimately drive higher conversion rates from your calls to action because the user is more invested in the content due to their participation. You can measure and optimize CTAs and choice-based behavioral insights to extract business value. Companies that invest in tech that allows them to build immersive user experiences reap the rewards of more loyal and satisfied customers. Investing in this format requires a change to your strategy and workflow. You need to think user experience first and video second more than in the other two forms of interactive video above. Check out an example of user experience video below. In this example, Deloitte puts the user in the driver’s seat by allowing them to choose their own path. Are you ready to reimagine and build video experiences that drive traffic from earned media, are relevant to the individual, drive behavior beyond eyeballs, and deliver meaningful data, insights and return on investment? Download Rapt Media’s new Strategic Guide and ROI Workbook to start building user experiences with video that drive valuable results.